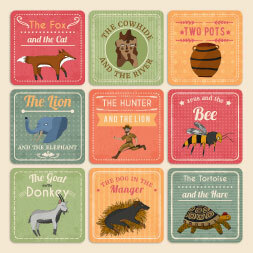 Learn more about Aesop’s Fables with morals. Aesop's Fables work their magic by enchanting us with animals that behave like people and events that could never happen. At the same time, they pass on some essential truths about life, love, war, and friendship that still hold meaning for us today. In essence, Aesops fables are fables with morals. These simple truths are summarised in the "moral" of each story. For any adult, it is useful to be reminded of the ancient wisdom found in Aesop’s Fables. The lessons to be learned are as applicable in the workplace as they are in our personal lives. The course is also perfect for parents with young children and teachers of primary school students who would like to get their children and students to read a selection of Aesop’s fables and to discuss the moral of each story. This practice encourages children to think more deeply about the stories they are reading and will help them deal with the complicated world in which they live.